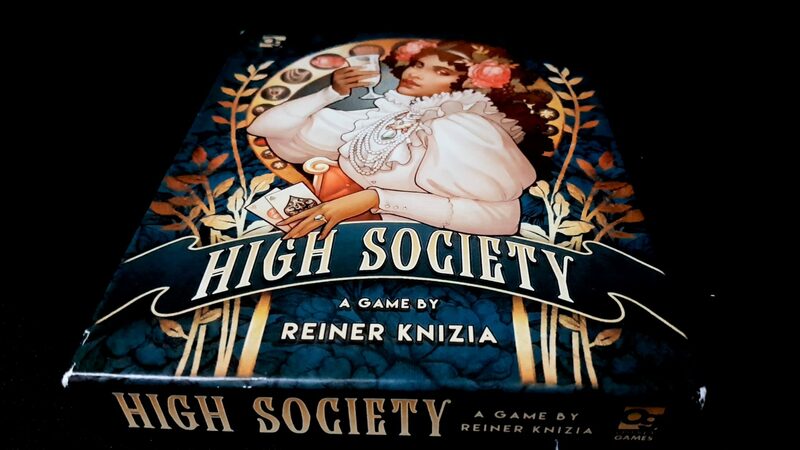 A review copy of High Society was provided by Asmodee UK in exchange for a fair and honest review. When you strip an auction down to its rawest, most essential component what you’re left with is a room full of people engaged in a collaborative nervous breakdown. The psychology at play in an auction is genuinely fascinating. The stresses and tensions of the real-time nature of bidding can throw a wrench into the working of our own rational estimation of value. There’s something about the romance of the event and the heat of the moment that causes an economic red mist to descend. The bids begin. There’s a brief moment of disassociation as your animal hind-brain takes control of your wallet and your mouth. There’s a crescendo – a moment of climax. A conclusion. A victory! No, a besting. And then there’s a comedown. A cooling of passions. At the end you’re looking at your new purchase with the mounting sense of dread that it wasn’t worth a fraction of what you paid for it. Sometimes we bid not to gain, but to win. 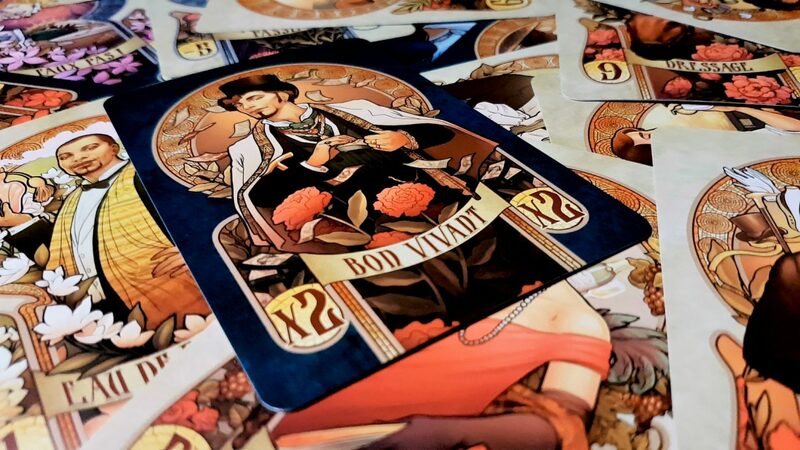 High Society abandons almost all of the trappings of theme and complexity that you’d expect from a modern edition of a classic game. There’s one kind of auction here – we’re playing ascending bids to secure the prize that’s laid in front of us. 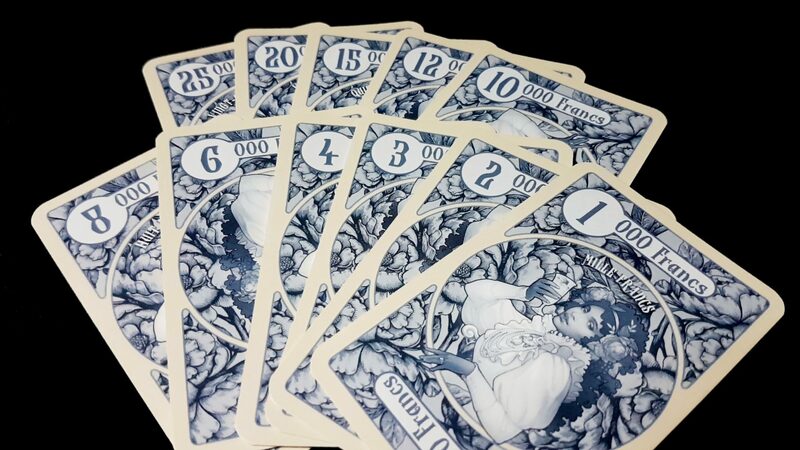 There’s nothing tangible that we’re trying to collect – the cards that make their way to the auction room represent something akin to the ineffable trappings of rank. We want them for the points they represent, putting the lie to the idea that you can’t buy class. 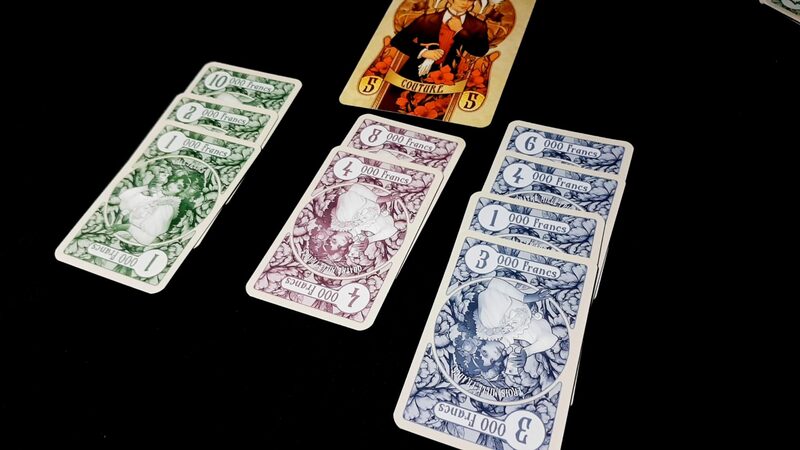 In High Society, breeding is only obtainable with cash We each have a chunk of money in various denominations, and we’re going to engage in a series of auctions until the fourth dark green card comes out of the deck. At the end of the game, the person with the largest sum total of points wins. Sort of. Knizia games almost always come with a sting in the tail – the thing that turns a workaday exercise of perfunctory playability into something more subtle. Just last week we discussed Modern Art on this blog – a deeper and more mechanically complex game with a leaky economy. Money enters and leaves the system at erratic intervals and that means richer players can bully others through a kind of dump and burn approach to financial asymmetry. Everyone starts with the same amount of money but a good sale will inject more cash into your wallet as if you were receiving an emergency transfusion from an indulgent billionaire. High Society on the other hand adopts an economy that is trending towards poverty. Everyone starts with the same money and they won’t be getting any more over the course of play. Instantly that changes the tenor and the texture of the experience. It becomes more deliberative because paradoxically the stakes get higher as the money supply gets tighter and that’s interesting. When you’ve got a payday in the offing, all you need to concern yourself with is the limited microeconomy between now and then. Money becomes disposable if it aids you in the accomplishment of a larger goal. The question of whether to spend $100 now to gets $200 later has a self-evident answer if you don’t need that $100. Spending that $100 when it’s not coming back… well. That changes things immensely. Onto this closed monetary system High Society lathers the various cognitive biases that get thrown into a blender by the mere existence of an auction. The endowment effect makes us value those things that we possess more than those things possessed by other people, and that extends to the things we potentially possess by virtue of having the current highest bid. Homo Econominus, that completely imaginary rational construct that once drove economic theory, would go in to an auction with a maximum price and refuse to exceed it. Real people are less driven by such cool, dispassionate detachment because auction fever can take hold. It takes hold because of the social context in which an auction is conducted – with other people injecting their own erratic and irrational behaviour into a stew of hormones and misfiring brain chemicals. The natural competitiveness of humanity comes into to play – you’re not just buying a thing. You’re beating an opponent. You’re asserting your dominance. You’re the alpha, and everyone has to acknowledge it. An auction is rich ground from which to begin when designing a game with few real mechanisms. Auctions by themselves can do an awful lot of heavy lifting. That’s not enough for High Society though because it stuffs a few more tricks up its sleeve to really tighten the ratchet on your economical nuts. They’re doozies, too. The first trick is that once you’ve played down a denomination of currency, you can’t pick it up again during the course of the bidding. If you put down your 1000 francs, you can’t just replace it with 2000 francs to double your bid. No, you’re committed to that original play. To increase your bid you add to the total. You can’t make change. You can’t ever get back a card you’ve spent. Just imagine what that does when you’re eyeing up the bids your opponents have made – you’re not just trading money, you’re trading away granularity of opportunity. Sure, you might only want to increase the bid by 1000 but that particular card can be awfully useful if you know nobody else has one lying around. When you up the bid on a valuable card by a grand and you know the smallest increment everyone else has available is 5000… well, let’s just say it gives you options. The end result of this is that you all eventually end up with your own weirdly inconvenient wallets that don’t resemble a cash balance so much as they do a golumb ruler. Every bid becomes not about what you can afford but rather what kind of deal you can construct. The closer you get to the price you’re willing to pay, the farther away you’re going to be in every future round. A few early bargains might find you looking at a hand that doesn’t permit you to play anything sensible for quite some time to come. Precision in bids is a property you sacrifice with every won lot. The second trick is that there are negative cards in the deck and you’re bidding to not pick them up. The player that bows out earliest gets it, but everyone else has to pay what they promised. These cards might be negative points or they might halve your entire total. High Society’s score is intensely punitive too in that it applies the negative effects before you apply the positive. There is an order in which penalties are applied and it’s never in your favour. It’s the third trick though that really adds the bite to High Society – at the end of the game, the player(s) with the lowest money left in hand are out of the game. Did you wince there? You probably should have winced. Imagine having so much money in hand that you know you can win the auction in front of you but also knowing you can’t spend it. Imagine sitting there with a single bill of money and knowing everyone else knows you can’t spend it. Imagine seeing a ten point card come up, having someone bid 1000 francs, and knowing that’s the bid that will win them the lot and the game. And then imagine knowing that’s your own damn fault. It might sound like having only a single card puts you completely on the sidelines, but you never know. There’s a satisfaction that comes from winning a bid with the final bill that just lost you the game, knowing you just won the game for someone else as a result. Sometimes your role in this is that you officiate at the coronation of someone else. And then imagine this in less obvious circumstances – being reluctant to bid because you think it might upset a delicate equilibrium you have been maintaining between score and wealth. Every time you outbid an opponent, you run the risk of pushing yourself into pauperdom especially when you’ve lost your ability to negotiate with single digit increments. This isn’t a game with a lot of variety, but it is one that has taken a single core auction style and refined the ever-living beejeezus out of it. There is so much going on here that decisions can carry with them a weight far beyond what a mere monetary value could ever hope to accomplish. It’s a rare auction game that manages to make you care as much about your low bids as your high bids. For most auction games, the excitement comes as everyone involved reaches the convergence of their willingness and the variable motivations start to create friction as they grind against each other. The highest price you might pay in High Society comes from your smallest expenditures. 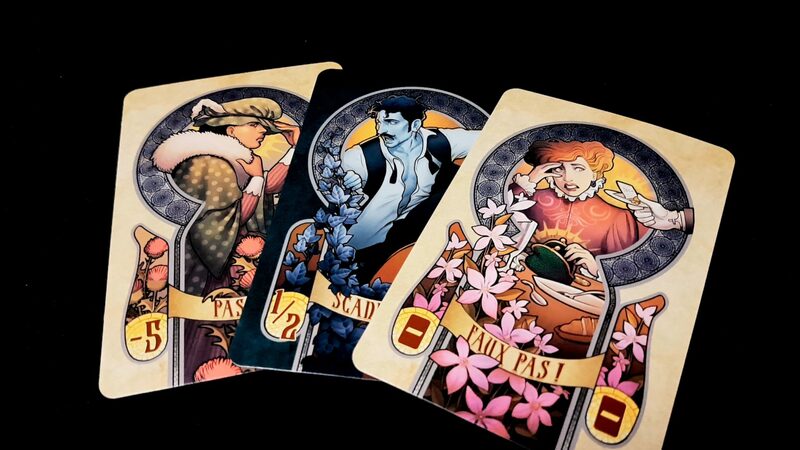 And wow, just look at the big, lush cards with which you’ll be working. 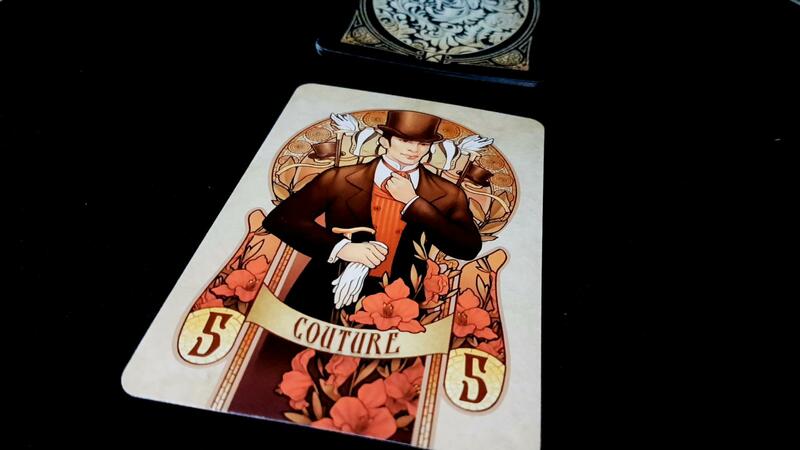 Osprey have done a truly marvellous job here making High Society a beautiful game. I mentioned in our review of Modern Art that a lot of effort went into making it look hideous – High Society looks like exactly what it purports to be: classy. The art is lovely, and it’s especially striking for how inclusive they’ve been with the representations. It’s just a beautiful package of a game where all its twists come together to create something mesmerizing. Simplicity merges flawlessly with a human complexity that renders it utterly inscrutable. That’s a great strength of the game but it’s also perhaps its largest, most significant drawback. You end up trying to solve the people rather than the puzzle, and that’s always something that is going to have diminishing returns. It’s a common theme with some games that they really thrive in the metagame of familiarity whilst never really investing in its ongoing development. The auction you’re engaging in here is mechanistically simple – there’s no varying sense of value because good cards are deterministically good and bad cards are deterministically bad. There are no circumstances where someone won’t want a ten and no circumstances in which someone will want the card the halves their points. That can make some of the auctions feel listless because nobody is interested in what’s on offer. Why would you care about a two if you know an eight is still left to appear, especially if you know that bidding is an act of economic self-harm? The good and bad cards lead to vibrant competition but the others feel like fillers. Similarly, the need to avoid being the poorest acts like a sedative on later rounds of the game when everyone is trying to balance their points versus their funds. A structural incentive to be reluctant to bid is a risky approach in an auction game. 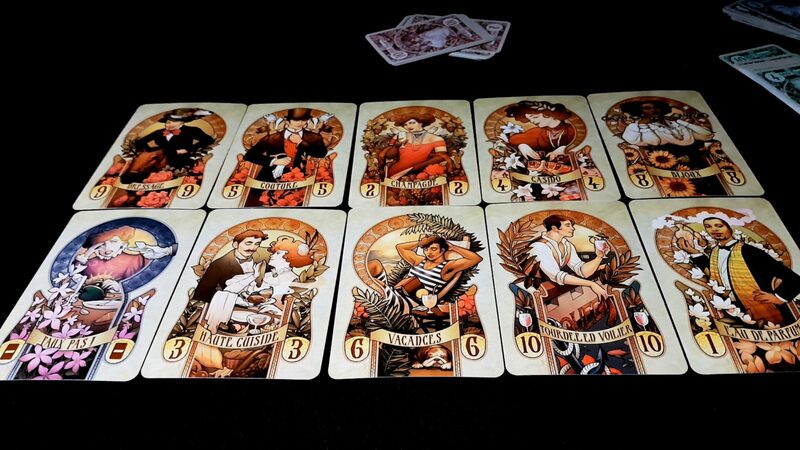 The ‘poorest player loses’ mechanism is genuinely clever and it inspires a lot of my affection for High Society. I’ve also seen people recoil from it as soon as they realise that’s how the game works. It feels artificial. More than that when it combines with the fact you can’t change the cards in your bid it feels like you’re battling the legalese of the game rather than the other players. Real auctions are full of recrimination and buyer’s remorse but those sentiments lose their power if you’re left feeling the blame lies with the game and not with the gamer. The puzzle of High Society lies in mastering the auction, but the challenge is only found in the weird and non-intuitive way it subverts expectations of value. Clever isn’t necessarily the same thing as fun, and there’s only so far you get in trying to convince people that it is. 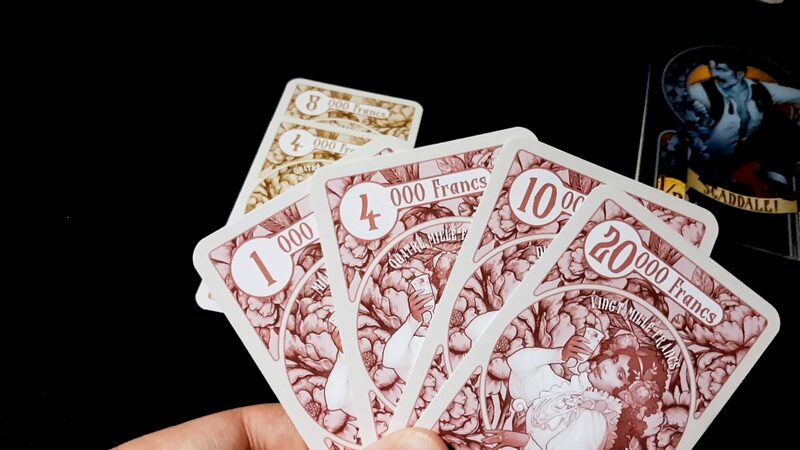 Still though, you could have played a few rounds of High Society in the time it takes you to set up Modern Art and those that do make peace with its oddly idiosyncratic bidding system will find a very enjoyable game in here. It’s one I will happily recommend, but only in circumstances where I was sure it would encounter a receptive mindset.